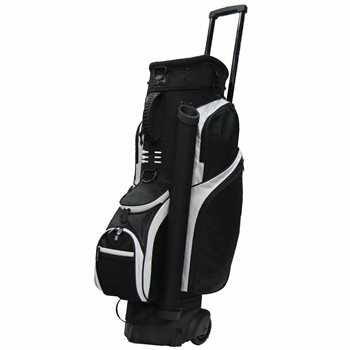 The RJ Sports Spinner cart bag is a revolutionary idea that incorporates a rolling wheel base and a retractable handle for easy transport from the trunk of your car to the golf cart. It also features a 9.5" 14-Way divider top, insulated beverage pocket, oversize external putter tube and a matching rain hood. Review by Flipper, 10 months ago.